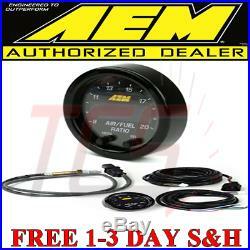 AEM 30-0300 X-Series Wideband Gauge AFR O2 UEGO Air Fuel Ratio 2 1/16 NEW MODEL. Part# 35-0300 Description X-SERIES WIDEBAND GAUGE AFR O2 UEGO AIR FUEL RATIO -Digital Technology X-Digital wideband technology gives the controller the ability to read and report values that other controllers do not, which can deliver more optimized engine tuning and a safer overall operating condition. The controller's high speed digital implementation ensures no loss of signal fidelity and full transient response, making it able to identify the slightest fluctuations in AFR and output them in full value. Features: X-Series Wideband UEGO AFR Controller Gauge were fastest responding wideband air/fuel ratio controllers in an independent test vs. 17 competitor wideband AFR controllers. Includes Bosch 4.9LSU wideband UEGO sensor. Factory calibrated resistor does not require free-air calibration, but technology allows for free-air calibration as sensor ages if user desires. Compatible with vehicle/system voltages up to 16V. 0-5V and RS232 output for data logging and feedback control, AEMnet (CANbus) for data logging and daisy-chaining multiple controllers up to 16 cylinders. Can display AFR values in hundredths of. 52mm gauge diameter and slim 0.825 gauge depth. User configurable display via buttons on the gauge face for changing AFR values, Lambda and O2, and 3- or 4-digit display. Black bezel and black dual faced faceplate included. Specs: Display Gasoline values from 8.0:1 to 20.0:1 AFR. 0-5V Output Gasoline values from 8.5:1 to 18.0:1 AFR. CANbus Output Gasoline values from 8.0:1 to 20.0:1 AFR. CANbus Output Lambda values from. 0-5V Output Lambda values from. 0-5V Output E85 values from 5.7:1 to 12.0:1 AFR. 0-5V Output Ethanol values from 5.2:1 to 11.0:1 AFR. 0-5V Output Methanol values from 3.75:1 to 8.0:1 AFR. No APO/FPO and PO BOX addresses. These charges are the buyers responsibility. Welcome to TCS Automotive, where all your performance dreams are able to be made come true. From our humble start in 2003 out of a small 400 sq foot shop, we were able to hit the ground running and running hard. Moving forward a few years, we opened our first parts facility in 2006. This time it was 3,000sq foot, and we quickly learned we needed something larger. We then moved into a better piece of commercial property nestled between 3 large parts stores in 2008. We out grew that facility shortly after, and doubled the buildings size. With 12,000sq foot of shop space, 3,200 sq foot of office/ showroom/ engine clean room space we have grown to one of North Carolina's largest Performance Parts/ Sales/ Fabrication/ Tuning Shops. In this day and age you see so many come and go, so we have made it our life goal to be a landmark in the Performance Industry here in North Carolina not just in the past but in the future as well. If your ever in the area and would like to tour our facility, please don't hesitate to stop in and be greeted by our experienced staff who will take you on a guided tour. Import parts, Domestic parts, European parts, we do them all here. That's right, not your typical shop! Our bays are filled with everything from the simple engine swap customers, to wiring and diagnostic all the way to full on fabrication of parts. So next time your needing anything for your vehicle, give us a call or drop by. Some products are not legal in CA for use on pollution controlled vehicles except those that are exempt from CARB (California Air Resource Board). These products are designed for off road use only! It is the buyers sole responsibility to check with local and state vehicular codes and compliance. We are not liable for any damages to you or your automobile, as with any aftermarket part. If you feel that we can improve in any way please call or message us to let us know how as we aim to have the highest level of customer service in this industry. We do not endorse modification of vehicles for use in public highways, since government regulations may be violated. As an express condition of sale of any part, you agree to use the performance parts for the modification of vehicles for off-road use only. The item "AEM 30-0300 X-Series Wideband Gauge AFR O2 UEGO Air Fuel Ratio 2 1/16 NEW MODEL" is in sale since Wednesday, February 15, 2017. This item is in the category "eBay Motors\Parts & Accessories\Car & Truck Parts\Gauges\Other". The seller is "tcsautoparts" and is located in Greensboro, North Carolina. This item can be shipped to United States, Canada, United Kingdom, Denmark, Romania, Slovakia, Bulgaria, Czech republic, Finland, Hungary, Latvia, Lithuania, Malta, Estonia, Australia, Greece, Portugal, Cyprus, Slovenia, Japan, China, Sweden, South Korea, Indonesia, Taiwan, South africa, Thailand, Belgium, France, Hong Kong, Ireland, Netherlands, Poland, Spain, Italy, Germany, Austria, Russian federation, Israel, Mexico, New Zealand, Philippines, Singapore, Switzerland, Norway, Saudi arabia, Ukraine, United arab emirates, Qatar, Kuwait, Bahrain, Croatia, Malaysia, Brazil, Chile, Colombia, Costa rica, Dominican republic, Panama, Trinidad and tobago, Guatemala, El salvador, Honduras, Jamaica.